A vote by the Senate this morning sent the 2017-19 supplemental transportation budget to the governor for his consideration. It is the first of the three “supplemental” budgets to win full legislative approval. These are the budgets approved in mid-biennium to make adjustments to the existing budgets. Work is continuing on the supplemental capital and operating budgets. We will need to vote on final versions of those by the end of today if the legislative session is to end on its 60-day schedule. The updated budget includes new appropriations for two important projects in the 12th District, thanks in large part to the good work of local advocates who worked with me to make a strong case to the Senate Transportation Committee Chair Steve Hobbs (D-Lake Stevens) and other colleagues and staff. Special thanks to Chelan Mayor Mike Cooney, Wenatchee Mayor Frank Kuntz, and Chelan-Douglas Transportation Council Executive Director Jeff Wilkens who helped advocate with me for these projects. Combined with the $2 million toward US2/West Cashmere Bridge replacement, which remains in the budget, these appropriations mean nearly $3 million has been approved for 12th District transportation projects -- for this biennium -- outside of the new tax package approved in 2015. Our region can be very proud of what we have accomplished together. The increase in traffic on Highway 97A and State Route 150 in and out of Chelan could cause excessive delays at intersections that don’t have traffic signals. The lack of coordination between the Sanders/Woodin and Sanders/Johnson intersections (which are just 200 feet apart) is also an issue. The city is planning enhancements to its iconic Woodin Avenue Bridge, which include converting it to a one-way thoroughfare to increase accessibility and improve safety for pedestrians. The city also wants to address the nearby signal/intersection issues. This budget appropriation will support that work, which anticipates continued growth in the area. This new funding complements the $280 million still in the transportation budget for Woodin Avenue Bridge project. 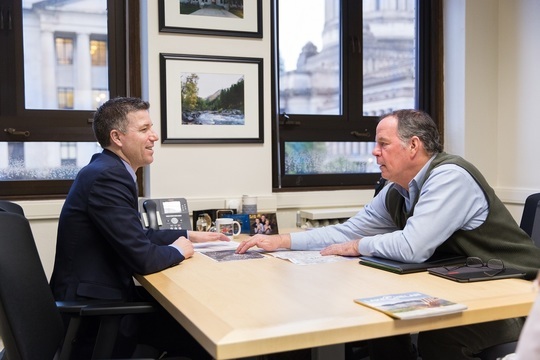 Chelan Mayor Mike Cooney met with me at the Capitol early in the legislative session to request funding to help with the traffic situation in Chelan. 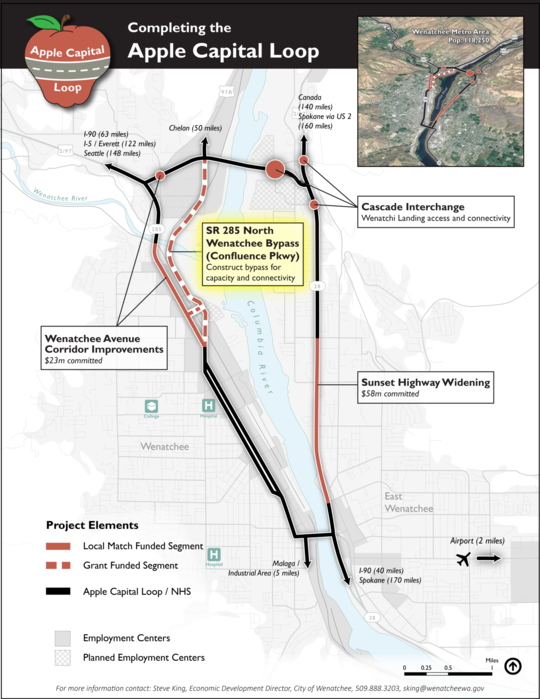 Late last year I wrote to the U.S. secretary of transportation in support of local efforts to obtain federal grant funding that will advance the Apple Capital Loop multimodal transportation project.The project includes the State Route 285 North Wenatchee Bypass, and that proposal requires environmental review – in the form of an environmental impact statement. An appropriation in the supplemental transportation budget will help the city of Wenatchee, as the lead agency, fund the EIS process. That in turn will help strengthen the federal grant proposal. Click here to learn more about Wenatchee's grant application. Wenatchee Mayor Frank Kuntz and Jeff Wilkens, executive director of the Chelan-Douglas Transportation Council, joined me to meet with Senator Steve Hobbs, chair of the Senate Transportation Committee. 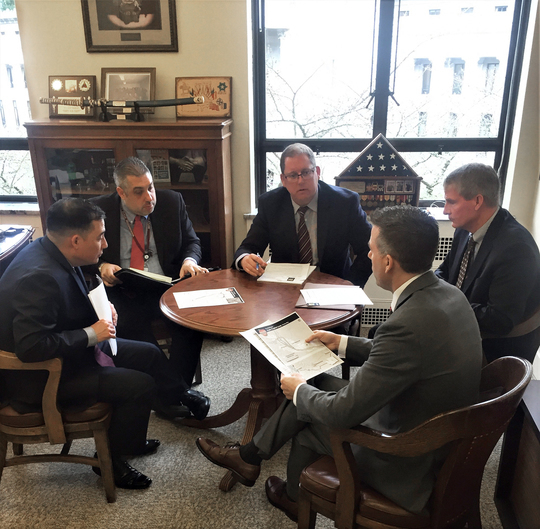 Together with Senate transportation policy staff, we explained how funding to begin an EIS would assist the Wenatchee Valley.